HC Verma ii Solutions for Class 12 Science Physics Chapter 16 Electromagnetic Induction are provided here with simple step-by-step explanations. These solutions for Electromagnetic Induction are extremely popular among class 12 Science students for Physics Electromagnetic Induction Solutions come handy for quickly completing your homework and preparing for exams. All questions and answers from the HC Verma ii Book of class 12 Science Physics Chapter 16 are provided here for you for free. You will also love the ad-free experience on Meritnation’s HC Verma ii Solutions. All HC Verma ii Solutions for class 12 Science Physics are prepared by experts and are 100% accurate. A metallic loop is placed in a nonuniform magnetic field. Will an emf be induced in the loop? If the flux through the loop does not vary, there will be no induced emf. Because the magnetic field is non-uniform and does not change with time, there will be no change in the magnetic flux through the loop. Hence, no emf will be induced in the loop. An inductor is connected to a battery through a switch. Explain why the emf induced in the inductor is much larger when the switch is opened as compared to the emf induced when the switch is closed. When we close the switch, the current takes some time to grow in the circuit. Due to this growth of current, the flux increases; hence, an emf is induced. On the other hand, when we open the switch, there is no path for the current to flow; hence, it suddenly drops to zero. This rate of decrease of current is much greater than the rate of growth of current when the switch is closed. So, when the switch is opened, the induced emf is more. The coil of a moving-coil galvanometer keeps on oscillating for a long time if it is deflected and released. If the ends of the coil are connected together, the oscillation stops at once. Explain. When the ends of the coil are not connected, the coil acts as an inductor in which oscillations persist until the current decays slowly. When these ends are connected, the coil forms a close loop; hence, there is inductance across the ends and the coil does not behave like an inductor. Therefore, all oscillations stop at once. A short magnet is moved along the axis of a conducting loop. Show that the loop repels the magnet if the magnet is approaching the loop and attracts the magnet if it is going away from the loop. Consider the above situation in which a magnet is moved towards a conducting circular loop. The north pole of the magnet faces the loop. As the magnet comes closer to the loop, the magnetic field increases; hence, flux through the loop increases. According to Lenz's law, the direction of induced current is such that it opposes the magnetic field that has induced it. Thus, the induced current produces a magnetic field in the direction opposite to the original field; hence, the loop repels the magnet. On the other hand, when the magnet is going away from the loop, the magnetic field decreases. Hence, flux through the loop decreases. According to Lenz's law, the induced current produces a magnetic field in the opposite direction of the original field; hence, the loop attracts the magnet. Two circular loops are placed coaxially but separated by a distance. A battery is suddenly connected to one of the loops establishing a current in it. Will there be a current induced in the other loop? If yes, when does the current start and when does it end? Do the loops attract each other or do they repel? Consider loops A and B placed coaxially as shown above. Let the direction of the current in loop A be clockwise when the battery is connected to it. According to the right-hand screw rule, the direction of the magnetic field due to this current will be towards left, as seen from the side of B. Due to a sudden flux through loop B, a current will be induced in it. It will only be induced for a moment when the current suddenly jumps from zero to a constant value. After it has attained a constant value, there will be no induced current. Now, according to Lenz's law, the direction of the induced current in loop B will be such that it will oppose the magnetic field due to loop A. Hence, a current will be induced in anti-clockwise direction in loop B. The induced current will flow in loop B as soon as the current grows in loop A and will end when the current through loop A becomes zero. Because the directions of the currents in the loops are opposite, they will repel each other. The battery discussed in the previous question is suddenly disconnected. Is a current induced in the other loop? If yes, when does it start and when does it end? Do the loops attract each other or repel? When the battery is suddenly disconnected, a current is induced in loop B due to a sudden change in the flux through it. It is only induced for a moment when the current suddenly falls to zero. There is no induced current after it has fallen to zero. According to Lenz's law, the induced current is such that it increases the decreasing magnetic field. So, if the current in loop A is in clockwise direction, the induced current in loop B will also be in clockwise direction. Hence, the two loops will attract each other. If the magnetic field outside a copper box is suddenly changed, what happens to the magnetic field inside the box? Such low-resistivity metals are used to form enclosures which shield objects inside them against varying magnetic fields. The varying magnetic field induces eddy currents on the walls of the copper box. There is a magnetic field due to the induced eddy currents, that is in opposite direction. As copper has good conductivity, thus the magnetic field due to the eddy currents will be strong. The magnetic field induced due to eddy currents in the copper walls cancel the original magnetic field. Thus, magnetic field does not penetrate the enclosure made of copper. The magnetic field inside the box remains zero. This is how a copper box protects the inside material from varying magnetic fields. Metallic (nonferromagnetic) and nonmetallic particles in a solid waste may be separated as follows. The waste is allowed to slide down an incline over permanent magnets. The metallic particles slow down as compared to the nonmetallic ones and hence are separated. Discuss the role of eddy currents in the process. When solid waste is allowed to slide over a permanent magnet, an emf is induced in metallic particles. This is because magnetic flux linked with the particles changes in this case. According to Lenz's law this induced emf opposes its cause i.e. downward motion along the inclined plane of the permanent magnet. On the other hand, non-metallic or insulating particles are free from such effects. As a result, the metallic particles slow down and hence get separated from the waste (or non-metallic particles). A pivoted aluminium bar falls much more slowly through a small region containing a magnetic field than a similar bar of an insulating material. Explain. An aluminium bar falls slowly through a small region containing a magnetic field because of the induced eddy currents (or induced emf) in it. According to Lenz's law this induced eddy current oppose its cause (its motion). Hence, it slows down while falling through a region containing a magnetic field. On the other hand, non-metallic or insulating materials are free from such effects. A metallic bob A oscillates through the space between the poles of an electromagnet (figure). The oscillations are more quickly damped when the circuit is on, as compared to the case when the circuit is off. Explain. When the circuit is on, eddy currents are produced on the surface of the metallic bob. Due to these eddy currents, thermal energy is generated in it. This thermal energy comes at the cost of the kinetic energy of the bob; hence, oscillations are more quickly damped when the circuit is on compared to when the circuit is off. Two circular loops are placed with their centres separated by a fixed distance. How would you orient the loops to have (a) the largest mutual inductance (b) the smallest mutual inductance? (a) For the largest mutual inductance, the two loops should be placed coaxially. In this case, flux through a loop due to another loop is the largest; hence, mutual inductance is the largest. (b) For the smallest mutual inductance, the two loops should be placed such that their axes are perpendicular to each other. In this case, flux through a loop due to another loop is the smallest (zero); hence, mutual inductance is the smallest. Consider the self-inductance per unit length of a solenoid at its centre and that near its ends. Which of the two is greater? From the above equation we can see that, self inductance per unit length will depend on the permeability of free space (μ0), number of turns per unit length (n) and area of the cross-section of the solenoid (A). All the above factors are constant at the centre and near any end of the solenoid therefore self inductance at both the points will be same. Consider the energy density in a solenoid at its centre and that near its ends. Which of the two is greater? In a solenoid energy is stored in the form of magnetic field. If a constant current is flowing from a solenoid then magnetic field inside the solenoid is uniform. Therefore, energy per unit volume (or energy density) in the magnetic field inside the solenoid is constant. u=B2μ0, where B is uniform magnetic field inside the solenoid. Therefore, energy density all points inside a solenoid is same. The emf at both ends is the same. So, the potential difference between the two ends is zero. When the switch is closed, the current will flow in downward direction in part AB of the circuit nearest to the closed loop. Due to current in wire AB, a magnetic field will be produced in the loop. This magnetic field due to increasing current will be the cause of the induced current in the closed loop. According to Lenz's law, the induced current is such that it opposes the increase in the magnetic field that induces it. So, the induced current will be in clockwise direction opposing the increase in the magnetic field in upward direction. Similarly, when the circuit is opened, the current will suddenly fall in the circuit, leading to decrease in the magnetic field in the loop. Again, according to Lenz's law, the induced current is such that it opposes the decrease in the magnetic field. So, the induced current will be in anti-clockwise direction, opposing the decrease in the magnetic field in upward direction. Solve the previous question if the closed loop is completely enclosed in the circuit containing the switch. According to Lenz's law, the induced current in the loop will be such that it opposes the increase in the magnetic field due to current flow in the circuit. Therefore, the direction of the induced current when the switch is closed is anti-clockwise. Similarly, when the switch is open, there is a sudden fall in the current, leading to decrease in the magnetic field at the centre of the loop. According to Lenz's law, the induced current in the loop is such that it opposes the decrease in the magnetic field. Therefore, the direction of the induced current when the switch is open is clockwise. As the magnet is moving under gravity, the flux linked with the copper tube will change because of the motion of the magnet. This will produce eddy currents in the body of the copper tube. According to Lenz's law, these induced currents oppose the fall of the magnet. So, the magnet will experience a retarding force. This force will continuously increase with increasing velocity of the magnet till it becomes equal to the force of gravity. After this, the net force on the magnet will become zero. Hence, the magnet will attain a constant speed. (d) move towards the solenoid or away from it depending on which terminal (positive or negative) of the battery is connected to the left end of the solenoid. The current will increase in the solenoid, flowing in clockwise direction in the circuit. Due to this increased current, the flux linked with the copper ring with increase with time, causing an induced current. This induced current will oppose the cause producing it. Hence, the current in the copper ring will be in anticlockwise direction. Now, because the directions of currents in the solenoid and ring are opposite, the ring will be repelled and hence will move away from the solenoid. (A) An emf can be induced by moving a conductor in a magnetic field. (B) An emf can be induced by changing the magnetic field. (a) Both A and B are true. (d) Both A and B are false. (d) increase or decrease depending on whether the semi-circle bulges towards the resistance or away from it. This induced emf will serve as a voltage source for the current to flow across resistor R, as shown in the figure. The direction of the current is given by Lenz's law and it is anticlockwise. If the wire is replaced by a semicircular wire, the induced current will remain the same, as it depends on the length of the wire and not on its shape (when B, v and R are kept constant). Figure shows a conducting loop being pulled out of a magnetic field with a speed v. Which of the four plots shown in figure (b) may represent the power delivered by the pulling agent as a function of the speed v? This relation is best represented by plot b in the figure. (d) attract or repel each other depending on the sense of the current. Consider loops A and B placed coaxially as above. Let the direction of the current in loop A be clockwise when a battery is connected to it. According to the right-hand screw rule, the direction of the magnetic field due to this current will be towards left. Now, the current through this loop will decrease with time due to increase in resistance with temperature. So, the magnetic field due to this current will also decrease with time. This changing current will induce current in loop B. Now, according to Lenz's law, the direction of the induced current in loop B will be such that it will oppose the decrease in the magnetic field due to loop A. Hence, current will be induced in clockwise direction in loop B. Also, because the direction of the currents in the loops is the same, they will attract each other. (d) clockwise or anticlockwise depending on whether the resistance is increased or decreased. We can see that the induced emf does not depend on the varying current through the solenoid and is zero for constant flux through the loop. Because there is no induced emf, no current is induced in the loop. Figure (a) shows the square loop moving in its plane with a uniform velocity v.
Figure (b) shows the equivalent circuit. No current will be induced in the circuit due to zero potential difference between the closed ends. A bar magnet is moved along the axis of a copper ring placed far away from the magnet. Looking from the side of the magnet, an anticlockwise current is found to be induced in the ring. Which of the following may be true? (a) The south pole faces the ring and the magnet moves towards it. (b) The north pole faces the ring and the magnet moves towards it. (c) The south pole faces the ring and the magnet moves away from it. (d) The north pole faces the ring and the magnet moves away from it. It can be observed that the induced current is in anti-clockwise direction. So, the magnetic field induced in the copper ring is towards the observer. According to Lenz's law, the current induced in a circuit due to a change in the magnetic flux is in such direction so as to oppose the change in flux. (1) The magnetic flux is increasing in the direction from the observer to the circular coil. 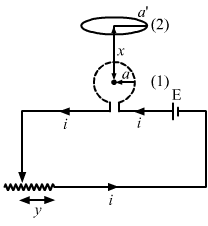 (2) The magnetic flux is decreasing in the direction from the coil to the observer. 1. The south pole faces the ring and the magnet moves away from it. 2. The north pole faces the ring and the magnet moves towards it. Thus, none of the above conditions is satisfied in the alternatives given. When translated or rotated about its axis, the magnetic flux through the loop does not change; hence, no emf is induced in the loop. When rotated about a diameter, the magnetic flux through the loop changes and emf is induced. On deforming the loop, the area of the loop inside the magnetic field changes, thereby changing the magnetic flux. Due to the change in the flux, emf is induced in the loop. (d) move the sheet away from the pole with uniform velocity if the metal is nonmagnetic. Neglect any effect of paramagnetism, diamagnetism and gravity. The strong magnetic pole will attract the magnet, so a force is needed to hold the sheet there if the metal is magnetic. If we move the metal sheet (magnetic or nonmagnetic) away from the pole, eddy currents are induced in the sheet. Because of eddy currents, thermal energy is produced in it. This energy comes at the cost of the kinetic energy of the plate; thus, the plate slows down. So, a force is needed to move the sheet away from the pole with uniform velocity. A constant current i is maintained in a solenoid. Which of the following quantities will increase if an iron rod is inserted in the solenoid along its axis? (d) rate of Joule heating. Iron rod has high permeability. When it is inserted inside a solenoid the magnetic field inside the solenoid increases. As magnetic field increases inside the solenoid thus the magnetic flux also increases. The Self-inductance (L) of the coil is directly proportional to the permeability of the material inside the solenoid. As the permeability inside the coil increases. Therefore, the self-inductance will also increase. Two solenoids have identical geometrical construction but one is made of thick wire and the other of thin wire. Which of the following quantities are different for the two solenoids? (d) time constant if one solenoid is connected to one battery and the other is connected to another battery. Because the solenoids are identical, their self-inductance will be the same. Because ρ and l are the same for both wires, the thick wire will have greater area of cross section and hence less resistance than the thin wire. Thus, time constants of the solenoids would be different if one solenoid is connected to one battery and the other is connected to another battery. Also, because the self-inductance of the solenoids is the same and the same current flows through them, the magnetic field energy given by 12Li2 will be the same. i is the same for both solenoids. Because the resistance of the coils are different, the rate of Joule heating will be different for the coils if the same current goes through them. An LR circuit with a battery is connected at t = 0. Which of the following quantities is not zero just after the connection? U=12Li2, as the current is zero the magnetic field energy will also be zero. Thus, the power delivered by the battery will also be zero. As, the LR circuit is connected to the battery at t = 0, at this time the current is on the verge to start growing in the circuit. So, there will be an induced emf in the inductor at the same time to oppose this growing current. A rod AB moves with a uniform velocity v in a uniform magnetic field as shown in figure. (a) The rod becomes electrically charged. (b) The end A becomes positively charged. (c) The end B becomes positively charged. (d) The rod becomes hot because of Joule heating. The direction of this induced emf is from A to B, that is, A is at the higher potential and B is at the lower potential. This is because the magnetic field exerts a force equal to qvB on each free electron where q is -1.6 × 10-16 C. The force is towards AB by Fleming's left-hand rule; hence, negatively charged electrons move towards the end B and get accumulated near it. So, a negative charge appears at B and a positive charge appears at A.
L, C and R represent the physical quantities inductance, capacitance and resistance respectively. Which of the following combinations have dimensions of frequency? f1 will have the dimensions of the frequency. f2 will have the dimensions of the frequency. Thus, f1f2 will have the dimensions of the frequency. The switches in figure (a) and (b) are closed at t = 0 and reopened after a long time at t = t0. (a) The charge on C just after t = 0 is εC. (b) The charge on C long after t = 0 is εC. (c) The current in L just before t = t0 is ε/R. (d) The current in L long after t = t0 is ε/R. It is given that the time t0 is very long. When the switch is opened, the current through the inductor after a long time will become zero. Calculate the dimensions of (a) ∫E→.dl,→ (b) vBl and (c) dΦBdt. The symbols have their usual meaning. Unit of voltage is J/C. (b) The quantity vBl is the product of quantities v, B and L.
(c) The quantity dϕdt is equal to the emf induced; thus, its dimensions are the same as that of the voltage. The flux of magnetic field through a closed conducting loop changes with time according to the equation, Φ = at2 + bt + c. (a) Write the SI units of a, b and c. (b) If the magnitudes of a, b and c are 0.20, 0.40 and 0.60 respectively, find the induced emf at t = 2 s.
According to the principle of homogeneity of dimensions, the dimensions of each term on both the sides of a correct equation must be the same. (a) The dimensions of the quantities at2, bt, c and ϕ must be the same. (a) The magnetic field in a region varies as shown in figure. Calculate the average induced emf in a conducting loop of area 2.0 × 10−3 m2 placed perpendicular to the field in each of the 10 ms intervals shown. (b) In which intervals is the emf not constant? Neglect the behaviour near the ends of 10 ms intervals. The magnetic flux at point O is 0. (b) Emf is not constant in the intervals 10 ms‒20 ms and 20 ms‒30 ms.
A conducting circular loop having a radius of 5.0 cm, is placed perpendicular to a magnetic field of 0.50 T. It is removed from the field in 0.50 s. Find the average emf produced in the loop during this time. As the loop is removed from the magnetic field, magnetic flux (ϕ2) = 0. A conducting circular loop of area 1 mm2 is placed coplanarly with a long, straight wire at a distance of 20 cm from it. The straight wire carries an electric current which changes from 10 A to zero in 0.1 s. Find the average emf induced in the loop in 0.1 s.
A square-shaped copper coil has edges of length 50 cm and contains 50 turns. It is placed perpendicular to a 1.0 T magnetic field. It is removed from the magnetic field in 0.25 s and restored in its original place in the next 0.25 s. Find the magnitude of the average emf induced in the loop during (a) its removal, (b) its restoration and (c) its motion. Because there is no change in the magnetic flux, no emf is induced. Suppose the resistance of the coil in the previous problem is 25Ω. Assume that the coil moves with uniform velocity during its removal and restoration. Find the thermal energy developed in the coil during (a) its removal, (b) its restoration and (c) its motion. (c) We know that energy is a scalar quantity. Also, the net thermal energy is the algebraic sum of the two energies calculated. A conducting loop of area 5.0 cm2 is placed in a magnetic field which varies sinusoidally with time as B = B0 sin ωt where B0 = 0.20 T and ω = 300 s−1. The normal to the coil makes an angle of 60° with the field. Find (a) the maximum emf induced in the coil, (b) the emf induced at τ = (π/900)s and (c) the emf induced at t = (π/600) s.
The induced emf becomes maximum when cos ωt becomes maximum, that is, 1. Figure shows a conducting square loop placed parallel to the pole-faces of a ring magnet. The pole-faces have an area of 1 cm2 each and the field between the poles is 0.10 T. The wires making the loop are all outside the magnetic field. If the magnet is removed in 1.0 s, what is the average emf induced in the loop? It is given that the magnitude of the magnetic field is 0.10 T and it is perpendicular to the area of the loop. A conducting square loop having edges of length 2.0 cm is rotated through 180° about a diagonal in 0.20 s. A magnetic field B exists in the region which is perpendicular to the loop in its initial position. If the average induced emf during the rotation is 20 mV, find the magnitude of the magnetic field. A conducting loop of face-area A and resistance R is placed perpendicular to a magnetic field B. The loop is withdrawn completely from the field. Find the charge which flows through any cross-section of the wire in the process. Note that it is independent of the shape of the loop as well as the way it is withdrawn. It is given that the loop is withdrawn from the magnetic field. radiuA long solenoid ofs 2 cm has 100 turns/cm and carries a current of 5 A. A coil of radius 1 cm having 100 turns and a total resistance of 20 Ω is placed inside the solenoid coaxially. The coil is connected to a galvanometer. If the current in the solenoid is reversed in direction, find the charge flown through the galvanometer. Figure shows a metallic square frame of edge a in a vertical plane. A uniform magnetic field B exists in the space in a direction perpendicular to the plane of the figure. Two boys pull the opposite corners of the square to deform it into a rhombus. They start pulling the corners at t = 0 and displace the corners at a uniform speed u. (a) Find the induced emf in the frame at the instant when the angles at these corners reduce to 60°. (b) Find the induced current in the frame at this instant if the total resistance of the frame is R. (c) Find the total charge which flows through a side of the frame by the time the square is deformed into a straight line. (a) The effective length of each side is the length that is perpendicular to the velocity of the corners. Thus, the effective length of each side is a sin θ. The north pole of a magnet is brought down along the axis of a horizontal circular coil (figure). As a result, the flux through the coil changes from 0.35 weber to 0.85 weber in an interval of half a second. Find the average emf induced during this period. Is the induced current clockwise or anticlockwise as you look into the coil from the side of the magnet ? The induced current is anti-clockwise when seen from the side of the magnet. A wire-loop confined in a plane is rotated in its own plane with some angular velocity. A uniform magnetic field exists in the region. Find the emf induced in the loop. When the wire loop is rotated in its own plane in a uniform magnetic field, the magnetic flux through it remains the same. Because there is no change in the magnetic flux, the emf induced in the wire loop is zero. Figure shows a square loop of side 5 cm being moved towards right at a constant speed of 1 cm/s. The front edge enters the 20 cm wide magnetic field at t = 0. Find the emf induced in the loop at (a) t = 2 s, (b) t = 10 s, (c) t = 22 s and (d) t = 30 s.
At this time square loop is completely inside the magnetic field, so there is no change in the flux linked with the coil with time. Therefore, induced emf in the coil at this time is zero. At this time loop is moving out of the field. At this time 2 cm part of the loop is ou t of the field. At this time loop is completely out of the field, so there is no change in the flux linked with the coil with time. Find the total heat produced in the loop of the previous problem during the interval 0 to 30 s if the resistance of the loop is 4.5 mΩ. The heat produced is found by taking the sum of the individual heats produced. There is no change in the emf from 5 s to 20 s and from 25 s to 30 s.
The current and voltage induced in the coil will be the same as that for the first 5 seconds. A uniform magnetic field B exists in a cylindrical region of radius 10 cm as shown in figure. A uniform wire of length 80 cm and resistance 4.0 Ω is bent into a square frame and is placed with one side along a diameter of the cylindrical region. If the magnetic field increases at a constant rate of 0.010 T/s, find the current induced in the frame. The magnetic field lines pass through coil abcd only in the part above the cylindrical region. The magnetic field in the cylindrical region shown in figure increases at a constant rate of 20.0 mT/s. Each side of the square loop abcd and defa has a length of 1.00 cm and a resistance of 4.00 Ω. Find the current (magnitude and sense) in the wire ad if (a) the switch S1 is closed but S2 is open, (b) S1 is open but S2 is closed, (c) both S1 and S2 are open and (d) both S1 and S2 are closed. (c) When both S1 and S2 are open, no current is passed, as the circuit is open. Thus, i = 0. (d) When both S1 and S2 are closed, the circuit forms a balanced a Wheatstone bridge and no current flows along ad. Thus, i = 0. Figure shows a circular coil of N turns and radius a, connected to a battery of emf ε through a rheostat. The rheostat has a total length L and resistance R. the resistance of the coil is r. A small circular loop of radius a' and resistance r' is placed coaxially with the coil. The centre of the loop is at a distance x from the centre of the coil. 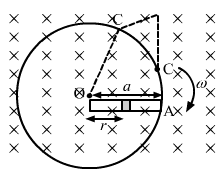 In the beginning, the sliding contact of the rheostat is at the left end and then onwards it is moved towards right at a constant speed v. Find the emf induced in the small circular loop at the instant (a) the contact begins to slide and (b) it has slid through half the length of the rheostat. Now, let y be the distance of the sliding contact from its left end. A circular coil of radius 2.00 cm has 50 turns. A uniform magnetic field B = 0.200 T exists in the space in a direction parallel to the axis of the loop. The coil is now rotated about a diameter through an angle of 60.0°. The operation takes 0.100 s. (a) Find the average emf induced in the coil. (b) If the coil is a closed one (with the two ends joined together) and has a resistance of 4.00 Ω, calculate the net charge crossing a cross-section of the wire of the coil. A closed coil having 100 turns is rotated in a uniform magnetic field B = 4.0 × 10−4 T about a diameter which is perpendicular to the field. The angular velocity of rotation is 300 revolutions per minute. The area of the coil is 25 cm2 and its resistance is 4.0 Ω. Find (a) the average emf developed in half a turn from a position where the coil is perpendicular to the magnetic field, (b) the average emf in a full turn and (c) the net charge displaced in part (a). 10π rad is swept in 1 s.
Δϕ = 0, thus emf induced will be zero. A coil of radius 10 cm and resistance 40 Ω has 1000 turns. It is placed with its plane vertical and its axis parallel to the magnetic meridian. The coil is connected to a galvanometer and is rotated about the vertical diameter through an angle of 180°. Find the charge which flows through the galvanometer if the horizontal component of the earth's magnetic field is BH = 3.0 × 10−5 T.
A circular coil of one turn of radius 5.0 cm is rotated about a diameter with a constant angular speed of 80 revolutions per minute. A uniform magnetic field B = 0.010 T exists in a direction perpendicular to the axis of rotation. Find (a) the maximum emf induced, (b) the average emf induced in the coil over a long period and (c) the average of the squares of emf induced over a long period. (b) The direction of the induced emf changes every instant. Thus, the average emf becomes zero. Suppose the ends of the coil in the previous problem are connected to a resistance of 100 Ω. Neglecting the resistance of the coil, find the heat produced in the circuit in one minute. Figure shows a circular wheel of radius 10.0 cm whose upper half, shown dark in the figure, is made of iron and the lower half of wood. The two junctions are joined by an iron rod. A uniform magnetic field B of magnitude 2.00 × 10−4 T exists in the space above the central line as suggested by the figure. The wheel is set into pure rolling on the horizontal surface. If it takes 2.00 seconds for the iron part to come down and the wooden part to go up, find the average emf induced during this period. As the wheel rotates, the wooden (non-metal) part of the wheel comes inside the magnetic field and the iron part of the wheel comes outside the magnetic field. Thus, the magnetic flux through the wheel becomes zero. A 20 cm long conducting rod is set into pure translation with a uniform velocity of 10 cm s−1 perpendicular to its length. A uniform magnetic field of magnitude 0.10 T exists in a direction perpendicular to the plane of motion. (a) Find the average magnetic force on the free electrons of the rod. (b) For what electric field inside the rod, the electric force on a free elctron will balance the magnetic force? How is this electric field created? (c) Find the motional emf between the ends of the rod. (b) The electrostatic force on the charged particle is qE. It is created because of the induced emf. A metallic metre stick moves with a velocity of 2 m s−1 in a direction perpendicular to its length and perpendicular to a uniform magnetic field of magnitude 0.2 T. Find the emf induced between the ends of the stick. A 10 m wide spacecraft moves through the interstellar space at a speed 3 × 107 m s−1. A magnetic field B = 3 × 10−10 T exists in the space in a direction perpendicular to the plane of motion. Treating the spacecraft as a conductor, calculate the emf induced across its width. The two rails of a railway track, insulated from each other and from the ground, are connected to a millivoltmeter. What will be the reading of the millivoltmeter when a train travels on the track at a speed of 180 km h−1? The vertical component of earth's magnetic field is 0.2 × 10−4 T and the rails are separated by 1 m.
So, the voltmeter will record 1 mV as the reading. A right-angled triangle abc, made from a metallic wire, moves at a uniform speed v in its plane as shown in figure. A uniform magnetic field B exists in the perpendicular direction. Find the emf induced (a) in the loop abc, (b) in the segment bc, (c) in the segment ac and (d) in the segment ab. (a) The emf induced in loop abc is zero, as there is no change in the magnetic flux through it. (c) There is no emf induced in segment bc, as the velocity is parallel to its length. The effective length of ab is along the direction perpendicular to its velocity. A copper wire bent in the shape of a semicircle of radius r translates in its plane with a constant velocity v. A uniform magnetic field B exists in the direction perpendicular to the plane of the wire. Find the emf induced between the ends of the wire if (a) the velocity is perpendicular to the diameter joining free ends, (b) the velocity is parallel to this diameter. Here, the component of length moving perpendicular to v is 2r. (b) When the velocity is parallel to the diameter of the semicircular wire, the component of its length perpendicular to its velocity is zero. A wire of length 10 cm translates in a direction making an angle of 60° with its length. The plane of motion is perpendicular to a uniform magnetic field of 1.0 T that exists in the space. Find the emf induced between the ends of the rod if the speed of translation is 20 cm s−1. We take the component of the length vector that is perpendicular to the velocity vector. A circular copper-ring of radius r translates in its plane with a constant velocity v. A uniform magnetic field B exists in the space in a direction perpendicular to the plane of the ring. Consider different pairs of diametrically opposite points on the ring. (a) Between which pair of points is the emf maximum? What is the value of this maximum emf? (b) Between which pair of points is the emf minimum? What is the value of this minimum emf ? (a) The maximum value of the emf is between the end points of the diameter perpendicular to the velocity. 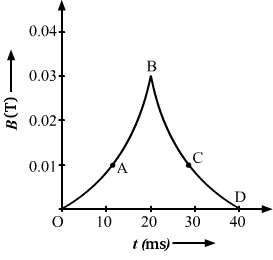 (b) The minimum value of emf is between the end points of the diameter parallel to the velocity of the ring. Figure shows a wire sliding on two parallel, conducting rails placed at a separation l. A magnetic field B exists in a direction perpendicular to the plane of the rails. What force is necessary to keep the wire moving at a constant velocity v ? 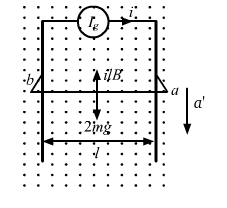 Because the force exerted by the magnetic field on the rod is given by Fmagnetic = ilB, the direction of this force is opposite to that of the motion of the rod. Now, let the external force on it be F.
Because the velocity is constant, the net force acting on the wire must be zero. Thus, F = Fmagnetic = ilB is acting in the direction of the velocity. Figure shows a long U-shaped wire of width l placed in a perpendicular magnetic field B. A wire of length l is slid on the U-shaped wire with a constant velocity v towards right. The resistance of all the wires is r per unit length. At t = 0, the sliding wire is close to the left edge of the U-shaped wire. Draw an equivalent circuit diagram, showing the induced emf as a battery. Calculate the current in the circuit. Because the length of the movable wire is l and the distance travelled by the movable wire in time t is vt, the total length of the loop is 2 (l + vt). Consider the situation of the previous problem. (a) Calculate the force needed to keep the sliding wire moving with a constant velocity v. (b) If the force needed just after t = 0 is F0, find the time at which the force needed will be F0/2. (a) Force F needed to keep the sliding wire moving with a constant velocity v will be equal in magnitude to the magnetic force on it. The direction of force F will be along the direction of motion of the sliding wire. Let at time t = T, the value of the force be F0/2. Consider the situation shown in figure. The wire PQ has mass m, resistance r and can slide on the smooth, horizontal parallel rails separated by a distance l. The resistance of the rails is negligible. A uniform magnetic field B exists in the rectangular region and a resistance R connects the rails outside the field region. At t = 0, the wire PQ is pushed towards right with a speed v0. Find (a) the current in the loop at an instant when the speed of the wire PQ is v, (b) the acceleration of the wire at this instant, (c) the velocity v as a functions of x and (d) the maximum distance the wire will move. A rectangular frame of wire abcd has dimensions 32 cm × 8.0 cm and a total resistance of 2.0 Ω. It is pulled out of a magnetic field B = 0.020 T by applying a force of 3.2 × 10−5 N (figure). It is found that the frame moves with constant speed. Find (a) this constant speed, (b) the emf induced in the loop, (c) the potential difference between the points a and b and (d) the potential difference between the points c and d.
(a) Let the velocity of the frame be v.
Figure shows a metallic wire of resistance 0.20 Ω sliding on a horizontal, U-shaped metallic rail. The separation between the parallel arms is 20 cm. An electric current of 2.0 µA passes through the wire when it is slid at a rate of 20 cm s−1. If the horizontal component of the earth's magnetic field is 3.0 × 10−5 T, calculate the dip at the place. Let the vertical component of the earth's magnetic field be Bv and the angle of the dip be δ. Because the rod is moving with a constant velocity, the net force on it is zero. Consider the situation shown in figure. The wires P1Q1 and P2Q2 are made to slide on the rails with the same speed 5 cm s−1. Find the electric current in the 19 Ω resistor if (a) both the wires move towards right and (b) if P1Q1 moves towards left but P2Q2 moves towards right. The sliding wires constitute two parallel sources of emf. The resistance of the sliding wires is 2 Ω. (b) When both wires move in opposite directions with the same speed, the direction of the emf induced in both of them is opposite. Thus, the net emf is zero. Suppose the 19 Ω resistor of the previous problem is disconnected. Find the current through P2Q2 in the two situations (a) and (b) of that problem. (a) When the wires move in the same direction, their polarity remains the same. The circuit remains incomplete. Therefore, no current flows in the circuit. (b) When the wires move in opposite directions, their polarities are reversed. Thus, current flows in the circuit. Consider the situation shown in figure. The wire PQ has a negligible resistance and is made to slide on the three rails with a constant speed of 5 cm s−1. Find the current in the 10 Ω resistor when the switch S is thrown to (a) the middle rail (b) the bottom rail. The length of the sliding wire becomes 4 × 10−2 m.
The current generator Ig' shown in figure, sends a constant current i through the circuit. The wire cd is fixed and ab is made to slide on the smooth, thick rails with a constant velocity v towards right. Each of these wires has resistance r. Find the current through the wire cd. Thus, the current passing through the circuit is ir-Blv2r. The current generator Ig' shown in figure, sends a constant current i through the circuit. The wire ab has a length l and mass m and can slide on the smooth, horizontal rails connected to Ig. The entire system lies in a vertical magnetic field B. Find the velocity of the wire as a function of time. Because current i passes through the sliding wire, the magnetic force on the wire (F) is ilB. The system containing the rails and the wire of the previous problem is kept vertically in a uniform horizontal magnetic field B that is perpendicular to the plane of the rails (figure). It is found that the wire stays in equilibrium. If the wire ab is replaced by another wire of double its mass, how long will it take in falling through a distance equal to its length? Let us consider the above free body diagram. As the net force on the wire is zero, ilB = mg.
Now, let a' be the acceleration of the wire in downward direction and t be the time taken by the wire to fall. v = v0(1 − e−Ft/mv0). As the force is in direction opposite to that of the motion of the frame . Velocity of the frame becomes constant when its acceleration becomes 0. As the speed thus calculated depends on F, R, B and d all of them are constant, therefore the velocity is also constant. Hence, proved that the frame moves with a constant velocity till the whole frame enters. Let the velocity at time t be v.
Figure shows a smooth pair of thick metallic rails connected across a battery of emf ε having a negligible internal resistance. A wire ab of length l and resistance r can slide smoothly on the rails. The entire system lies in a horizontal plane and is immersed in a uniform vertical magnetic field B. At an instant t, the wire is given a small velocity v towards right. (a) Find the current in it at this instant. What is the direction of the current? (b) What is the force acting on the wire at this instant? (c) Show that after some time the wire ab will slide with a constant velocity. Find this velocity. According to Fleming's left hand rule the force in the wire ab will be in the upward direction. Moreover, a moving wire ab is equivalent to a battery of emf vBl as shown in the figure. At the given instant, the net emf across the wire (e) is E − Bvl. The direction of the current is from b to a. (c) The velocity of the wire attains a value such that it satisfies E = Bvl. The net force on the wire becomes zero. Thus, the wire moves with a constant velocity v.
A conducting wire ab of length l, resistance r and mass m starts sliding at t = 0 down a smooth, vertical, thick pair of connected rails as shown in figure. A uniform magnetic field B exists in the space in a direction perpendicular to the plane of the rails. (a) Write the induced emf in the loop at an instant t when the speed of the wire is v. (b) What would be the magnitude and direction of the induced current in the wire? (c) Find the downward acceleration of the wire at this instant. (d) After sufficient time, the wire starts moving with a constant velocity. Find this velocity vm. (e) Find the velocity of the wire as a function of time. (f) Find the displacement of the wire as a function of time. (g) Show that the rate of heat developed in the wire is equal to the rate at which the gravitational potential energy is decreased after steady state is reached. (a) When the speed of the wire is v, the emf developed in the loop is, e = Blv. Due to motion of the wire in the magnetic field there is a force in upward direction (perpendicular to the wire). (d) Let the wire start moving with a constant velocity. x is the position of the wire at instant t.
A bicycle is resting on its stand in the east-west direction and the rear wheel is rotated at an angular speed of 100 revolutions per minute. If the length of each spoke is 30.0 cm and the horizontal component of the earth's magnetic field is 2.0 × 10−5 T, find the emf induced between the axis and the outer end of a spoke. Neglect centripetal force acting on the free electrons of the spoke. A conducting disc of radius r rotates with a small but constant angular velocity ω about its axis. A uniform magnetic field B exists parallel to the axis of rotation. Find the motional emf between the centre and the periphery of the disc. The angular velocity of the disc is ω. Also, the magnetic field of magnitude B is perpendicular to the disc. Let us take a circular element of thickness da at a distance a from the centre. 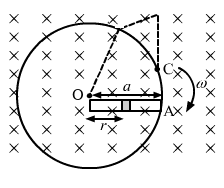 Figure shows a conducting disc rotating about its axis in a perpendicular magnetic field B. A resistor of resistance R is connected between the centre and the rim. Calculate the current in the resistor. Does it enter the disc or leave it at the centre? The radius of the disc is 5.0 cm, angular speed ω = 10 rad/s, B = 0.40 T and R = 10 Ω. Let us consider a rod of length 0.05 m fixed at the centre of the disc and rotating with the same ω. As the disc is rotating in the anti-clockwise direction, the emf induced in the disc is such that the centre is at the higher potential and the periphery is at the lower potential. Thus, the current leaves from the centre. The magnetic field in a region is given by B→=k→B0Ly where L is a fixed length. A conducting rod of length L lies along the Y-axis between the origin and the point (0, L, 0). If the rod moves with a velocity v = v0 i→, find the emf induced between the ends of the rod. We will consider a small element of length dy on the rod. 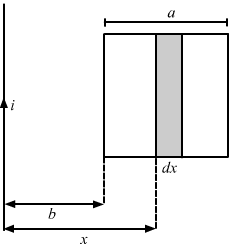 Figure shows a straight, long wire carrying a current i and a rod of length l coplanar with the wire and perpendicular to it. The rod moves with a constant velocity v in a direction parallel to the wire. The distance of the wire from the centre of the rod is x. Find the motional emf induced in the rod. Consider a situation similar to that of the previous problem except that the ends of the rod slide on a pair of thick metallic rails laid parallel to the wire. At one end the rails are connected by resistor of resistance R. (a) What force is needed to keep the rod sliding at a constant speed v? (b) In this situation what is the current in the resistance R? (c) Find the rate of heat developed in the resistor. (d) Find the power delivered by the external agent exerting the force on the rod. (a) Here, the magnetic field B→ due to the long wire varies along the length of the rod. Now, let the current produced in the circuit containing the rod and the resistance be i'. (d) Power delivered by the external agency is the same as the rate of heat developed. Figure shows a square frame of wire having a total resistance r placed coplanarly with a long, straight wire. The wire carries a current i given by i = i0 sin ωt. Find (a) the flux of the magnetic field through the square frame, (b) the emf induced in the frame and (c) the heat developed in the frame in the time interval 0 to 20πω. Let us consider an element of the loop of length dx at a distance x from the wire. A rectangular metallic loop of length l and width b is placed coplanarly with a long wire carrying a current i (figure). The loop is moved perpendicular to the wire with a speed v in the plane containing the wire and the loop. Calculate the emf induced in the loop when the rear end of the loop is at a distance a from the wire. solve by using Faraday's law for the flux through the loop and also by replacing different segments with equivalent batteries. Consider an element of the loop of length dx at a distance x from the current-carrying wire. The magnetic flux through the loop is calculated by integrating the above expression. The emf. 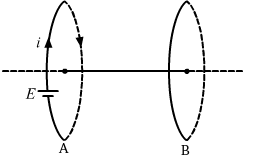 induced in AB and CD due to their motion in the magnetic field are opposite to each other. 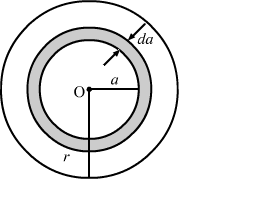 Figure shows a conducting circular loop of radius a placed in a uniform, perpendicular magnetic field B. A thick metal rod OA is pivoted at the centre O. The other end of the rod touches the loop at A. The centre O and a fixed point C on the loop are connected by a wire OC of resistance R. A force is applied at the middle point of the rod OA perpendicularly, so that the rod rotates clockwise at a uniform angular velocity ω. Find the force. It is given that the angular velocity of the disc is ω and the magnetic field perpendicular to the disc is having magnitude B. Let us take an element of the rod of thickness dr at a distance r from the centre. The direction of the current is from point A to point O in the rod. Consider the situation shown in the figure of the previous problem. Suppose the wire connecting O and C has zero resistance but the circular loop has a resistance R uniformly distributed along its length. The rod OA is made to rotate with a uniform angular speed ω as shown in the figure. Find the current in the rod when ∠ AOC = 90°. As ∠AOC = 90°, the minor and major segments of AC are in parallel with the rod. The resistances of the segments are R4 and 3R4. Consider a variation of the previous problem (figure). Suppose the circular loop lies in a vertical plane. The rod has a mass m. The rod and the loop have negligible resistances but the wire connecting O and C has a resistance R. The rod is made to rotate with a uniform angular velocity ω in the clockwise direction by applying a force at the midpoint of OA in a direction perpendicular to it. Find the magnitude of this force when the rod makes an angle θ with the vertical. When the circular loop is in the vertical plane, it tends to rotate in the clockwise direction because of its weight. Let the force applied be F and its direction be perpendicular to the rod. The component of mg along F is mg sin θ. 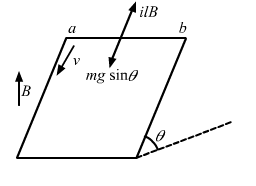 The magnetic force is in perpendicular and opposite direction to mg sin θ. The net force passes through the centre of mass of the rod. Because the rod rotates with a constant angular velocity, the net torque on it is zero. Figure shows a situation similar to the previous problem. All parameters are the same except that a battery of emf ε and a variable resistance R are connected between O and C. Neglect the resistance of the connecting wires. Let θ be the angle made by the rod from the horizontal position (show in the figure), measured in the clockwise direction. During the part of the motion 0 < θ < π/4 the only forces acting on the rod are gravity and the forces exerted by the magnetic field and the pivot. However, during the part of the motion, the resistance R is varied in such a way that the rod continues to rotate with a constant angular velocity ω. Find the value of R in terms of the given quantities. It is given that the rod is rotated with angular speed in clockwise direction. The emf induced in the rod (e) is Bωa22, with O at the lower potential and A at the higher potential. Because the rod rotates with uniform angular velocity, the net torque about point O is zero. A wire of mass m and length l can slide freely on a pair of smooth, vertical rails (figure). A magnetic field B exists in the region in the direction perpendicular to the plane of the rails. The rails are connected at the top end by a capacitor of capacitance C. Find the acceleration of the wire neglecting any electric resistance. Let the velocity of the rod at an instant be v and the charge on the capacitor be q. The potential difference across the terminals of the capacitor and the ends of the rod must be the same, as they are in parallel. The force on the rod due to the magnetic field and its weight are in opposite directions. The electric field at the given point has the value same as that in the above case. The current in an ideal, long solenoid is varied at a uniform rate of 0.01 As−1. The solenoid has 2000 turns/m and its radius is 6.0 cm. (a) Consider a circle of radius 1.0 cm inside the solenoid with its axis coinciding with the axis of the solenoid. Write the change in the magnetic flux through this circle in 2.0 seconds. (b) Find the electric field induced at a point on the circumference of the circle. (c) Find the electric field induced at a point outside the solenoid at a distance 8.0 cm from its axis. An average emf of 20 V is induced in an inductor when the current in it is changed from 2.5 A in one direction to the same value in the opposite direction in 0.1 s. Find the self-inductance of the inductor. Let the self-inductance of the inductor be L.
A magnetic flux of 8 × 10−4 weber is linked with each turn of a 200-turn coil when there is an electric current of 4 A in it. Calculate the self-inductance of the coil. The current in a solenoid of 240 turns, having a length of 12 cm and a radius of 2 cm, changes at a rate of 0.8 A s−1. Find the emf induced in it. Find the value of t/τ for which the current in an LR circuit builds up to (a) 90%, (b) 99% and (c) 99.9% of the steady-state value. An inductor-coil carries a steady-state current of 2.0 A when connected across an ideal battery of emf 4.0 V. If its inductance is 1.0 H, find the time constant of the circuit. We know that time constant is the ratio of the self-inductance (L) of the coil to the resistance (R) of the circuit. A coil having inductance 2.0 H and resistance 20 Ω is connected to a battery of emf 4.0 V. Find (a) the current at the instant 0.20 s after the connection is made and (b) the magnetic field energy at this instant. A coil of resistance 40 Ω is connected across a 4.0 V battery. 0.10 s after the battery is connected, the current in the coil is 63 mA. Find the inductance of the coil. An inductor of inductance 5.0 H, having a negligible resistance, is connected in series with a 100 Ω resistor and a battery of emf 2.0 V. Find the potential difference across the resistor 20 ms after the circuit is switched on. The time constant of an LR circuit is 40 ms. The circuit is connected at t = 0 and the steady-state current is found to be 2.0 A. Find the current at (a) t = 10 ms (b) t = 20 ms, (c) t = 100 ms and (d) t = 1 s.
An L-R circuit has L = 1.0 H and R = 20 Ω. It is connected across an emf of 2.0 V at t = 0. Find di/dt at (a) t = 100 ms, (b) t = 200 ms and (c) t = 1.0 s.
What are the values of the self-induced emf in the circuit of the previous problem at the times indicated therein? An inductor-coil of inductance 20 mH having resistance 10 Ω is joined to an ideal battery of emf 5.0 V. Find the rate of change of the induced emf at (a) t = 0, (b) t = 10 ms and (c) t = 1.0 s.
An LR circuit contains an inductor of 500 mH, a resistor of 25.0 Ω and an emf of 5.00 V in series. Find the potential difference across the resistor at t = (a) 20.0 ms, (b) 100 ms and (c) 1.00 s.
An inductor-coil of resistance 10 Ω and inductance 120 mH is connected across a battery of emf 6 V and internal resistance 2 Ω. Find the charge which flows through the inductor in (a) 10 ms, (b) 20 ms and (c) 100 ms after the connections are made. An inductor-coil of inductance 17 mH is constructed from a copper wire of length 100 m and cross-sectional area 1 mm2. Calculate the time constant of the circuit if this inductor is joined across an ideal battery. The resistivity of copper = 1.7 × 10−8 Ω-m.
An LR circuit having a time constant of 50 ms is connected with an ideal battery of emf ε. find the time elapsed before (a) the current reaches half its maximum value, (b) the power dissipated in heat reaches half its maximum value and (c) the magnetic field energy stored in the circuit reaches half its maximum value. Let the current reach half of its maximum value in time t.
(b) Let t be the time at which the power dissipated is half its maximum value. A coil having an inductance L and a resistance R is connected to a battery of emf ε. Find the time taken for the magnetic energy stored in the circuit to change from one fourth of the steady-state value to half of the steady-state value. At the steady state, current in the coil, i = εR. Let the magnetic energy reach one-fourth of its steady-state value in time t1 and let it reach half of its value in time t2. A solenoid having inductance 4.0 H and resistance 10 Ω is connected to a 4.0 V battery at t = 0. Find (a) the time constant, (b) the time elapsed before the current reaches 0.63 of its steady-state value, (c) the power delivered by the battery at this instant and (d) the power dissipated in Joule heating at this instant. (b) As the current reaches 0.63 of its steady-state value, i = 0.63 i0. The magnetic field at a point inside a 2.0 mH inductor-coil becomes 0.80 of its maximum value in 20 µs when the inductor is joined to a battery. Find the resistance of the circuit. Let the resistance in the circuit be R and the steady state value of the current be i0. An LR circuit with emf ε is connected at t = 0. (a) Find the charge Q which flows through the battery during 0 to t. (b) Calculate the work done by the battery during this period. (c) Find the heat developed during this period. (d) Find the magnetic field energy stored in the circuit at time t. (e) Verify that the results in the three parts above are consistent with energy conservation. (a) Let the current in the LR circuit be i. Let the charge flowing through the coil in the infinitesimal time dt be dq. The above expression is equal to the energy drawn from the battery. Therefore, the conservation of energy holds good. An inductor of inductance 2.00 H is joined in series with a resistor of resistance 200 Ω and a battery of emf 2.00 V. At t = 10 ms, find (a) the current in the circuit, (b) the power delivered by the battery, (c) the power dissipated in heating the resistor and (d) the rate at which energy is being stored in magnetic field. Two coils A and B have inductances 1.0 H and 2.0 H respectively. The resistance of each coil is 10 Ω. Each coil is connected to an ideal battery of emf 2.0 V at t = 0. Let iA and iB be the currents in the two circuit at time t. Find the ratio iA / iB at (a) t = 100 ms, (b) t = 200 ms and (c) t = 1 s.
(a) At t = 0.1 s, time constants of the coils A and B are τA and τB, respectively. The current in a discharging LR circuit without the battery drops from 2.0 A to 1.0 A in 0.10 s. (a) Find the time constant of the circuit. (b) If the inductance of the circuit 4.0 H, what is its resistance? Now, let the time constant be τ. In time t = 0.10 s, the current drops to 1 A. Let the resistance in the circuit be R.
A constant current exists in an inductor-coil connected to a battery. The coil is short-circuited and the battery is removed. Show that the charge flown through the coil after the short-circuiting is the same as that which flows in one time constant before the short-circuiting. Consider an inductance L, a resitance R and a source of emf ξ are connected in series. Let a constant current i0 (=ξR) is maitened in the circuit before removal of the battery. Consider the circuit shown in figure. (a) Find the current through the battery a long time after the switch S is closed. (b) Suppose the switch is again opened at t = 0. What is the time constant of the discharging circuit? (c) Find the current through the inductor after one time constant. (a) Because the switch is closed, the battery gets connected across the L‒R circuit. After a long time, t→∞. Thus, the effect of inductance vanishes. (b) When the switch is opened, the resistance are in series. (c) The inductor will discharge through resistors R1 and R2. A current of 1.0 A is established in a tightly wound solenoid of radius 2 cm having 1000 turns/metre. Find the magnetic energy stored in each metre of the solenoid. The magnetic energy density is given by B22μ0. Consider a small cube of volume 1 mm3 at the centre of a circular loop of radius 10 cm carrying a current of 4 A. Find the magnetic energy stored inside the cube. A long wire carries a current of 4.00 A. Find the energy stored in the magnetic field inside a volume of 1.00 mm3 at a distance of 10.0 cm from the wire. The mutual inductance between two coils is 2.5 H. If the current in one coil is changed at the rate of 1 As−1, what will be the emf induced in the other coil? Find the mutual inductance between the straight wire and the square loop of figure. Let us first calculate the flux through the square frame. Let us now consider an element of loop of length dx at a distance x from the wire. Find the mutual inductance between the circular coil and the loop shown in figure. A solenoid of length 20 cm, area of cross-section 4.0 cm2 and having 4000 turns is placed inside another solenoid of 2000 turns having a cross-sectional area 8.0 cm2 and length 10 cm. Find the mutual inductance between the solenoids. Let the current through the solenoid-2 be i. The current in a long solenoid of radius R and having n turns per unit length is given by i = i0 sin ωt. A coil having N turns is wound around it near the centre. Find (a) the induced emf in the coil and (b) the mutual inductance between the solenoid ant the coil. (b) Let the mutual inductance of the coils be m.